Dog Licenses are available either via mail or in the Office of the Town Clerk, 8:30 am to 4:00 pm Monday through Friday. Use the link below if you currently have a dog licensed in Chelmsford. 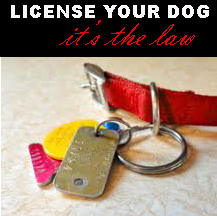 If you have a new dog that has never been licensed in town, please come into the Town Clerk's Office to license for the first time. CREDIT/DEBIT CARDS: We accept MasterCard®, Discover®, American Express® and VISA®*. If you are using a Debit Card, it will be treated as a credit card payment and will have the same charges associated with credit card payments. *VISA is available for Tax Payments only. The convenience fee for using a credit card is 2.95% of the payment, with a minimum fee of $1.00. Dog Licenses are good for a calendar year January 1 through December 31. They are available beginning December 1 of the year prior. Please make sure that the rabies information on file is up-to-date before submitting (check rabies section on last year's paper license) or send in a copy of the rabies certificate and everything will be returned, along with a self-addressed, stamped envelope. Please allow at least two weeks for processing through the mail. The fee will be $20 per unaltered dog and $15 per spayed or neutered dog until the end of February. Beginning March 1, the fee will be increased $5 per month until June 30 when the fee is frozen at $35 or $40 per unaltered dog. Failure to license a dog will result in issuance of an additional $50 citation. Unpaid license fees, late fees, and citations are cumulative. If the dog is new to Chelmsford and not previously licensed, the fee is $20 per unaltered dog and $15 per spayed or neutered dog, in which case kindly send a check for the appropriate amount per dog made out to the Town of Chelmsford, a copy of the rabies certificate, and a self-addressed, stamped envelope. Call 978-250-5205 if you have any questions.